Cilfach01691 648731work Self-cateringA stone-built detached barn conversion just five minutes walk from the centre of Llanfyllin providing quality, well-equipped accommodation for six people with three bedrooms and three bathrooms. 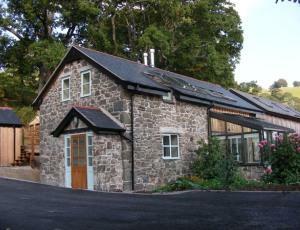 The cottage has a high quality oak kitchen with a modern wood-fired range. There is wood-fired central heating (looked after by the owner), a log stove in the sitting room and solar water heating - all making the cottage very cosy. There is a comfortable South-facing conservatory and seating in the garden. There is private parking for two vehicles. The cottage is in a very quiet setting with plentiful opportunities for walking, cycling, bird watching and relaxing. You can book directly with us by phone on 01691 648731 or by email at decia@cilfachcottage.co.uk or through the booking system below. Cilfach offers weekly bookings starting on Friday and sometimes short breaks.